It's been a little while since I did some quilting rather than piecing. 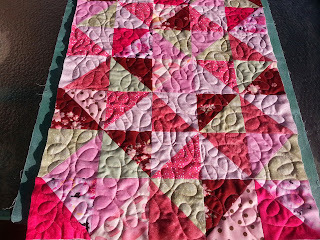 This of course means that I have several pieces lining up to be quilted, but I have done one today. It's not quite finished, as it still needs its binding, but the quilting was fun. I just did a loopy free-motion swirl all over since there were so many triangles and straight lines there it needed some softening. Here is what it looked like prior to quilting. It really changes the whole look, but then that's really what quilting is all about (as well as a beautiful way to keep the backing and wadding together). I'm not convinced about the fabric I'm auditioning for the binding, but equally unsure about what else to try (suggestions welcome). If I had some of the dark maroon/burgundy type fabric I would probably use that, but of course I don't have enough. This was really a 'scrap' project anyway, prompted by the hot pink. It's for a friend who has chair cushions in her dining room in that hot pink - and a brown table runner that she's been meaning to replace for a while she said. So within the next day or so some kind of binding will be attached and the table runner find its correct place on her table. Then I can get on to quilting those topsy turvy houses I've been having fun with. The quilting looks so cute! If you are still looking for binding ideas, I would go scrappy.